Surfaces with carboxylic groups covalently bound are dedicated to promote the covalent immobilisation of compounds containing reactive free amino groups using the EDC mediated amination. The amino group presents in any molecules, such as peptides or proteins, binds to biomat COOH through formation of amide bonds between the amino group presents in the molecule and the surface carboxylic group by the action of carbodiimide. The surface is modified with carboxylic groups. 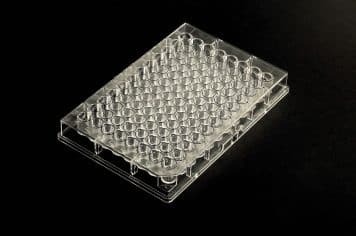 Volume of treatment 200 µl/well. 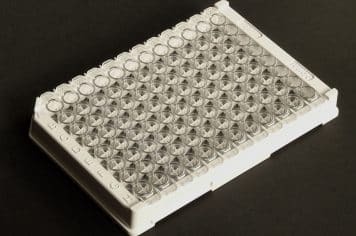 Microplates show a CV% less than 5 when are used as a catcher of biotin-hydrazide in an ELISA format, using streptavidin-HRP as detector and TMB as substrate.